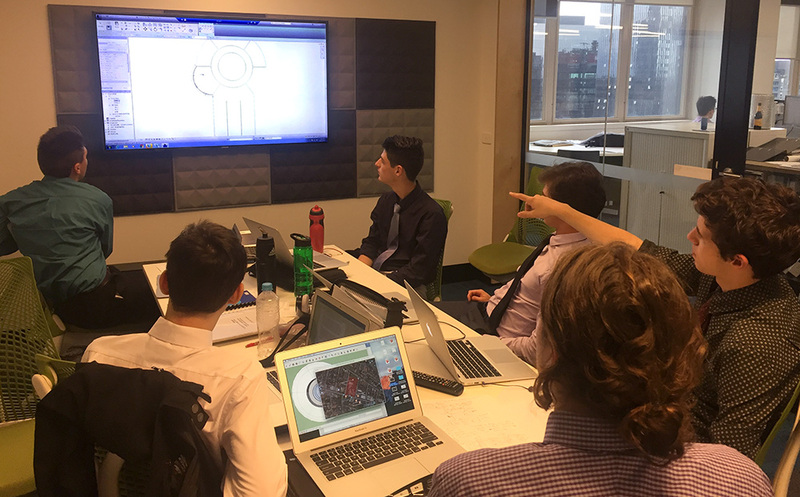 Working in collaboration with engineering firms, the Engineering Students @ Work program provides a week long work experience for Year 10 students. Students typically are hosted by an engineering company and are expected to act as professional employees. They are provided a brief in line with real projects that the company has or is working on. 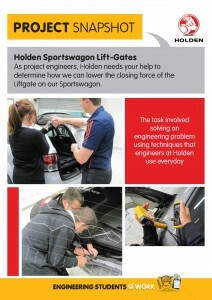 Special attention is put towards designing environmentally sustainable solutions. The Engineering Students @ Work program was launched with a team of students from Santa Maria College hosted by the Engineering firm Norman Disney & Young in late 2009. Working on a brief to develop concepts for an energy efficient green office building, the girls not only learned about engineering but also working as a team. The results were outstanding. At the end of the week, students present in front of real engineers as well as teachers and parents. 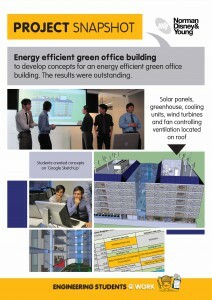 They write a professional report and perhaps even a 3D or physical model of their design. An Engineering Students @ Work team was followed through their week at Norman Disney & Young. This DVD defines the program and the outcomes the students achieve. Pictured in the DVD are students from Catholic Regional College in North Keilor, Eryn O’Mahoney, Teacher at CRC and Peter Koulos from NDY. 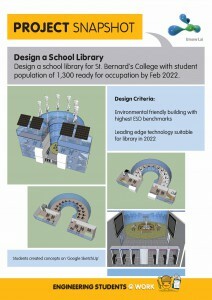 The DVD was produced by Simon Lindsay, Catholic Education Office Melbourne. “With a recognised shortage of skilled engineers in the Australian workforce, it is incumbent upon the engineering industry to inform and promote the exciting opportunities and rewards that the engineering profession can offer. 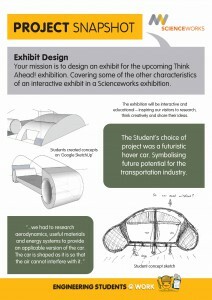 The concept of “Engineering Students @ Work” was conceived in 2009 between Norman Disney & Young and Akorn Educational Services and provides the link into schools for students to experience the engineering profession. 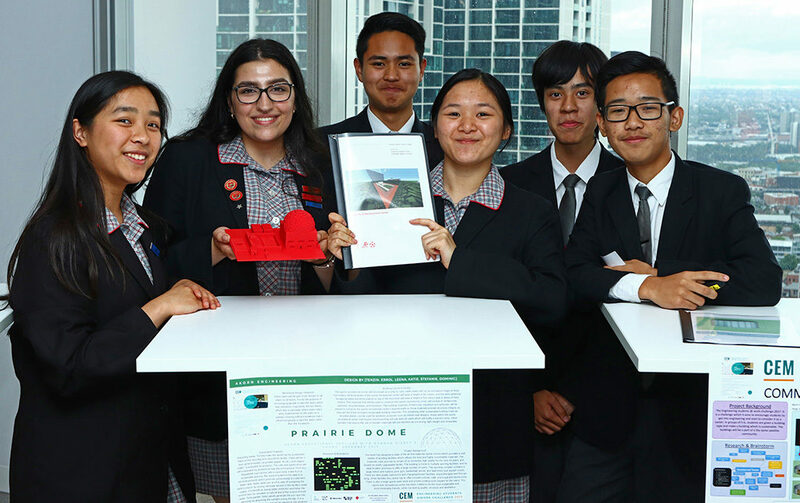 The objectives of the program are to provide a realistic engineering experience for secondary students, allow students to learn about the diversity and vitality of engineering, work with active professional engineers and develop an understanding of collaborative working. 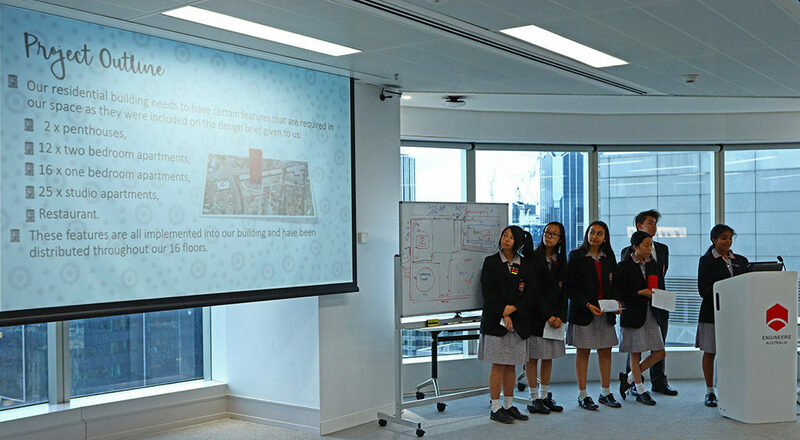 5 teams of students worked co-currently at the offices of Engineers Australia. Models of their buildings were printed using MakerBot 3D Printers.